This week has been really uneventful, so instead of any letter describing the week, let me present to you my best apple related finds on Etsy. 1. This reversible tote is so cute! I love the color combination of the strap together with the square patterned fabric and the apple fabric. 2. I love dresses and this apple patterned dress in happy colors would be a perfect fit for me! Too bad the size isn't the right one. 3. Who doesn't love cute buttons? There are adorable! I just need to make some baby clothes to put them on. And a baby to make them for. 4. Packing your lunch and bring to work is a great way to save money. And with these reusable sandwich and snack bags you can also be environmentally friendly at the same time! 5. A great apron is something everyone needs. This apron in automny colors would be awesome to wear as I welcome my guests to our Thanksgiving dinner. 7. 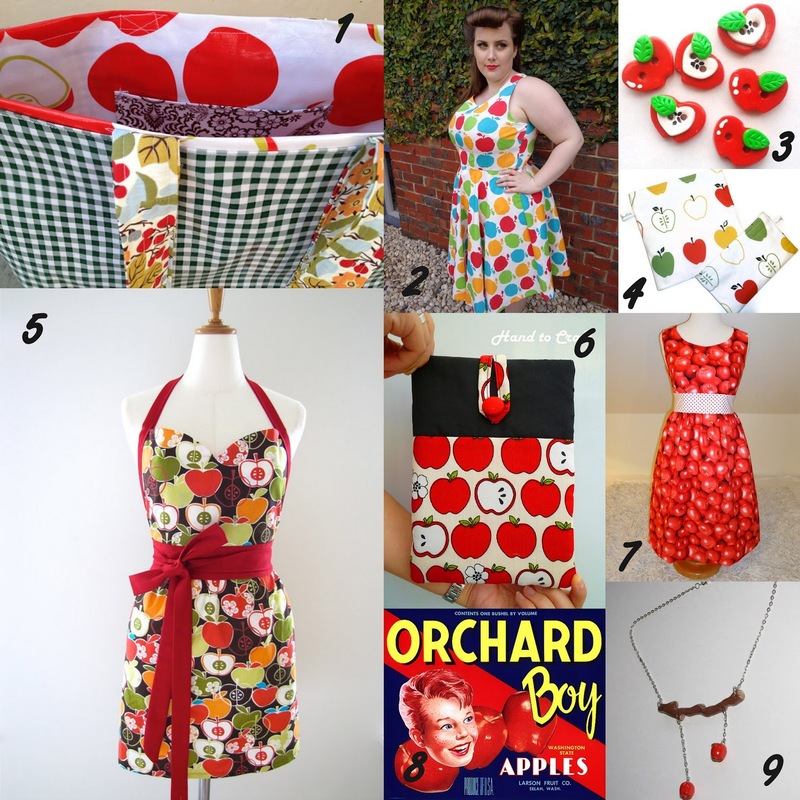 If you love apples so much you want to wear them, this is the dress for you! I think there was even a green version of it if that's more your color. 8. What about a vintage apple crate label? 9. There are so many different apple necklaces on Etsy, but this one with a branch and falling apples caught my attention! So what to do when you have a large amount of apples? I guess making apple sauce is one of the obvious answers. Since I've never made apple sauce before, Google was as always the answer to my prayers and I ended up using this recipe as a starting point for my own sauce. Cutting and peeling apples is definitely not my favorite part, especially not when the apples are small and many, but after what felt like peeling a gazillion apples I had finally filled my big pot. This is what 4 liters of peeled apples look like. And then I just threw in the sugar, cloves and water. And squeezed the lemon over it before I put it over medium heat on the stove. Yep, here it is on the stove. Still looks pretty much like just 4 liters of peeled apples. I didn't really know what to expect when cooking the apples. The recipe didn't say much about how much time I should cook them, and then it said that I would have to mash when they had become soft. I discovered quite soon that the apples seemed to be mashing themselves while cooking, so I just left the pot simmering on the stove while occasionally stirring and observing that more and more of the apples disintegrated and became sauce. Getting saucier and saucier by the minute. When most of the apple chunks had become mashed, I started fishing out the cloves (this is the point where you are glad you counted the number of cloves you threw in, that way you know when you've found them all). I also took a fork and mashed some of the bigger chunks. Now it really starts to look like apple sauce. When the sauce was more or less chunk free (not perfectly so since I didn't run it through a food processor or blender) I added the butter. At this point I had turned the heat down to low, but the sauce was still cooking. I was surprised at how the butter changed the sauce. I thought it already tasted good and had a nice, saucy consistency, but the butter made both the taste and the consistency so much smoother! If you feel that your apple sauce is too tart, I would recommend you to wait adding more sugar until after you have added the butter. The butter might give the sauce the right amount of sweetness. 5 boxes for us, one box for my nice neighbor who gave us the apples. My 4 liters of apples turned into to around 2 liters of apple sauce. We will have some of it with our dinner tonight (pork sirloin) and the rest I will freeze. I'm already thinking about making a second batch of it because it was so easy to make, and it turned out really great! Red is my color. It has always attracted me. And since this week is dedicated apples, nothing fits better than also apple red nails. After a manicure that was a little too much for me a couple of weeks ago, I decided to do something with another of the colors in the Passport to Color collection. I decided to combine OPI's Cajun Shrimp with Chanel's Rouge Fatal. and my nail polish doesn't start to flake off that easily. I still can't really make a straight line with a nail polish brush (or any other kind of brush with nail polish on it for that matter), but I'm almost starting to get a hold on making dots with a sewing pin stuck on a pencil. The dotted line was supposed to be straight, but who cares? I like the contrast between the Cajun Shrimp and the Rouge Fatal. I might even do this same combination again at some other time. I have said it before, and I say it again: I'm not much of a baker. 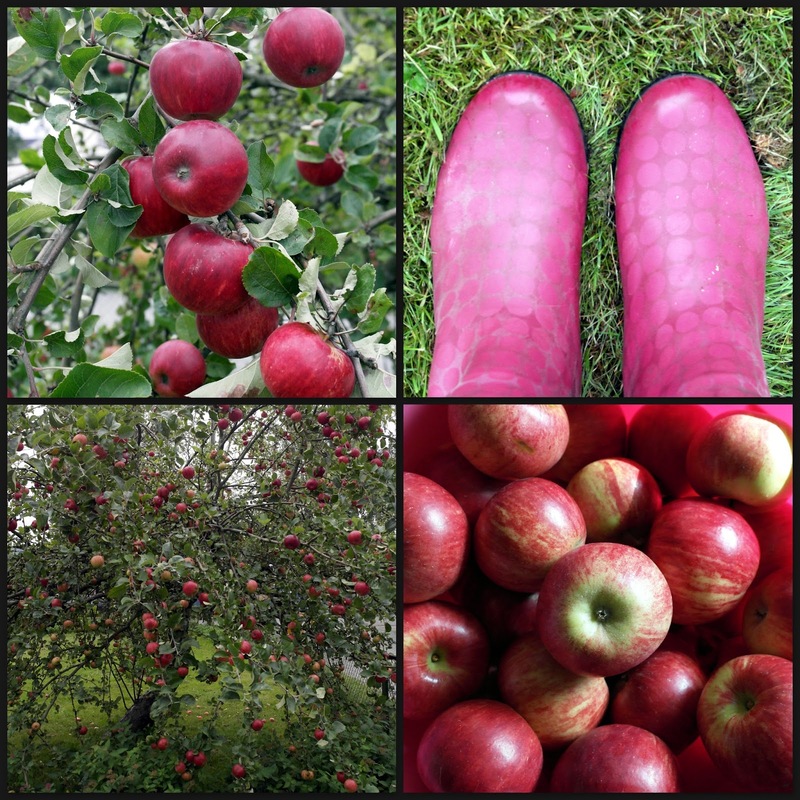 However, I guess it is inevitable to make an apple pie when you get such wonderful apples from your neighbor. Google is my best friend in moments like this, and this recipe sounded wonderful. I read some of the comments about it before starting to make it, so I decided on adding 1tbsp corn flour and some cinnamon. I love how well cinnamon works together with apples. I made two small to share with my neighbor and one big for my husband and me. I also chose to buy pie crust this time, since I had so much trouble the last. The recipe didn't call for it, but the ones who remember my troubles with the blueberry pie might understand that I chose to pre-bake the pie crust before adding the filling. instead of pouring the batter over them. I poured the apples and the batter over the crusts and made some kind of square pattern with the rest of the pie dough. It was a little bit difficult since the pie dough I bough was round while the thing I use as a pie tin is square (and strictly speaking not a tin either). Yea, I admit it, I have some problems cutting even strips. The pies baked for an hour and just started to smell better and better and better. 5 minutes before they were done, I took them out and sprinkled them with a little bit of sugar mixed with cinnamon before I put them back in again for the last 5 minutes. lie like a too small blanket on top of the pie. The batter consisted of butter, sugar, a little bit of water, a little bit of all purpose flour and a little bit of corn starch. I have no idea how that batter is supposed to become solid, and it absolutely didn't. It tasted much better than it looked! In a way it was the blueberry pie all over again - it looked like a mess, but tasted heavenly! And was perfect together with a glass of saft. But seriously, has anyone a suggestion for a pie that is so easy to bake that even I can do it perfectly? Today's Meatless Monday is heavily inspired by my favorite blogger, The Glamorous Librarian. It is just simply roasted vegetables with apples, olive oil and some spices. I have a serious hang up on apples since my neighbor has a garden filled with an excellent variety of them. I know the most usual way of using apples in cooking, is making apple sauce. I will also do that, but this time I just wanted big chunks of warm, tasty apples. I chopped up good sized chunks of apples, carrots, onions and celery root, threw them in a casserole dish together with some olive oil, salt, pepper and rosemary. I love the automny colors! I would have loved to have grown my own herbs, but I'm not capable of keeping a cactus alive so I'll have to practice a lot before that will be reality. So for now I have to settle with the dried, store bought spices. I let the veggies bake in the oven for around 45 minutes on 200C (400F) and it turned out great! This is another example to show that cooking doesn't have to be complicated in order to be delicious! I of course made far too much for us, so we had the leftovers as a side later in the week. No photo today because there's nothing to take a photo of. The weather turned this week, and going from sunny and warm to cloudy and cold was not really in my consideration when I planted the lemon tree. I think this week has been too cold and the pot hasn't gotten enough sun. I dug up all the seeds and none of them had germinated. I will however try again some time this week, but first I will have to get a grow lamp for my lemon tree. I will come back with an update next Sunday! Hopefully that update will be filled with a grow lamp and some newly planted seeds! Labels: How is my lemon tree doing? 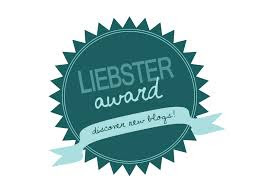 Wow, suddenly I was nominated for the Liebster Award by a blogger I didn't even know about. #thatfeeling ! There are so many awesome things about the nomination, but one of them is that it lead me to discover several really good blogs. I love how it is a way to motivate myself to write better, take better photos, and to do something with any creative idea I have. 2. What do you dislike about blogging? I'm quite strict with myself and always put up rules that I have to follow. When blogging I make rules like "Meatless Monday" every week, post at least once every weekday etc. Sometimes I'm not very motivated to write the post I need for that day. But then just posting a photo can be the solution, and the next day I'm feeling better again. 3. One trend that you absolutely love and one that you hate? Oh, difficult question since I immediately think about fashion and I in no way am a fashionista or actually really interested in fashion at all. But then I realized that a trend can be anything. One trend I really like, is that buying second hand isn't just for poor people anymore. It is ok to make a conscious choice of thinking more about the environment and less about what is brand new and shiny. The trend I hate? UGGs. I really hate those things that some people call shoes. They are ugly. They are not shoes. They don't deserve to be called shoes. They are just things to put on your feet that look silly. 4. One piece of jewellery that you don't leave the house without? My engagement ring and my wedding band. I feel naked without them! 5. On your nails, dark, bright or pale nail polish? Oh, that varies. But I think the nail polish I use the most often is Essie Mademoiselle, so I guess the answer will be pale. No, but we babysit my mother's dog relatively often. 7. What is the one little thing that gets on your nerves? People that wants to help in the kitchen and then use hours to chop the vegetables because they have no clue how to use a knife. I then really prefer just chopping them myself. 8. If you could change one thing in your life with a snap of your fingers, what would that be? I'm really happy with my life and can't really think of anything I'd like to change. Maybe I'd swap some of the crappy pair of shoes I've bought in my time for one or two pairs of Louboutins? 9. Favourite dish and dessert? I don't really think there is a specific dish I would say is my favorite no matter what, it all depends on the setting I do however love pizza with garlic, onion, parma ham, mushrooms and artichokes. I'd rather have a good cheese plate than dessert..
10. Favourite type of music? I've already declared my love for JK Rowling and Harry Potter here on the blog. I also adore Le petit Prince by Antoine de Saint-Exupéry. So what are the questions I want answered? 1. What was the main motivation for you to start blogging? 2. What blog post are you especially proud of? 3. What blog post are you now almost a little embarrassed having posted? 4. What do you serve the first time you invite your date for dinner at your place? 6. Do you remember what was the first book you bought for your own money? And why did you choose that book? 8. Describe how a blog post is usually written by you (I want to know the whole process). 10. What beauty product can't you live without? 11. Describe yourself with 3 words. This week has been all about Stephanie Fleshman and her YA novel Render. You can read my intro and see a book trailer here, an interview with her here, a guest post by her here, and an excerpt of the book here. I have received a free copy of the book in exchange for my review, this will however not influence my opinion about the book. Koldan, an 18 year old prodigy, thinks he has his life in front of him; a promising career as a doctor and the most wonderful girlfriend - Raya - that he plans to marry. But when his grandfather dies, everything changes when he finds a diary filled with mystical clues. These clues lead Koldan and Raya on to a dangerous voyage. Together with them they have Lukas, Koldan's younger brother, and their friend Ethan. Not until it seems to be too late, they realize how everything is connected through Koldan and Lukas' Russian heritage, and the reasons why their grandfather fled Russia when he was 18. Will Koldan manage to escape from his destiny and save his relationship with Raya? While in Glasgow a few weeks back, I read a book review in The Independent on Sunday that ended with "As empty as its protagonist, the novel is stuck in her superficial worldview and lacks the gravitas or literary panache to puss us out of it." I don't have the literary quality to even write such a sentence, but more importantly - this is not how I feel about Render. However, there are some things I find troublesome during my reading of the book. One of the most annoying things I know about, is loose ends. But equally annoying are loose beginnings. And unfortunately there are several of them in Render. What is a loose beginning, you may ask? It is when suddenly something appears without being well enough built up to. For me at least, it felt like it was out of the blue when the kids left on the voyage. What was so exciting with the diary that made them do it? How come Raya's and Lukas' parents let them travel all the way from the US to Australia? They're only 17, so they would need some kind of permission. Why were Raya and Lukas suddenly so close friends that they didn't have to speak to each other, they would instinctively understand what the other person was thinking? Nothing before that moment described their friendship as that close. And why would the story have to take place on a remote, lost island? I have the feeling the author was so excited about the action part of the story she wanted to tell, that she sometimes forgot that it isn't just about the action, it is also about understanding why the action is happening. I have also read that the story is supposed to be in the paranormal genre, at it takes place in a world very similar to our own, but that it isn't our world. In this book, there aren't any hints of paranormalcy, neither are there any hints about their world not being our world. But not everything is bad. Far from it! 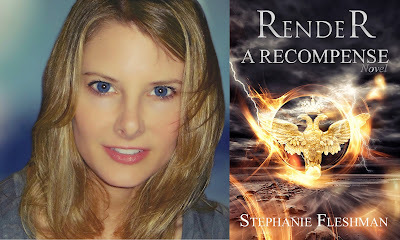 Stephanie Fleshman writes well. She doesn't fill her story with clichés and plump language. The story is constantly driven forward, and she doesn't linger with unnecessary descriptions of people and places. The reader wants to know what is going to happen on the next page, and we want to know if everything will be ok with Koldan and Raya. The end makes it clear that this is the first book of a series, and I really hope some of the loose beginnings (and loose ends!) will be closed and better explained in the next books. It might also become clear why the author considers the book to be paranormal, and what the difference between their world and our world is. I know I will be reading them, because I have started to care about Koldan, Raya, Lukas and Ethan.